With the Applied Factory set you will save almost a half pound of weight. Weight savings is just one of the many benefits of using the ORIGINAL after market triple clamp. 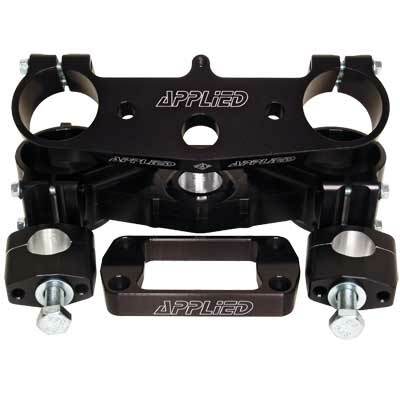 This 21mm clamp set is designed to improve handling. 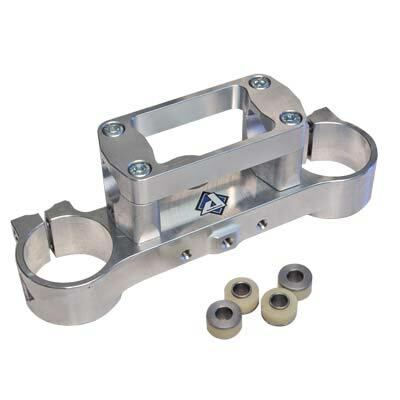 The CNC machined billet aluminum clamps are far superior in strength and durability. Fork bores are precision machined for a perfect fit and greater clamping surface. Bar mounts are reversible to allow for two bar positions. This provides more roominess and smoother standing to sitting transitions. Optional height bar mounts are available up to +10mm. Rubber Mounted clamps are available also. The Factory set comes complete with Upper and Lower Triple Clamp, reversible bar mounts, one piece bar mount strap, and grade 8.8 hardware. Applied clamps are made in the USA in our own facility and have a lifetime warranty to the original purchaser even for crash damage.